Justin Underwood, 21, of Bayport, was rescued and unharmed. Blue Point, NY - July 29, 2016 - Suffolk County Police Marine Bureau officers rescued a man who was thrown from his boat by a wave in the Great South Bay this morning. During the rainstorm, Justin Underwood was operating a 2011 19-foot NauticStar vessel on the Great South Bay off Blue Point when he briefly let go of the steering wheel to check his position on his cell phone at 7:10 a.m. The boat hit a wave and Underwood was thrown overboard and the vessel continued westbound out of sight. The Suffolk County Police Department received a 911 call at 8:06 a.m. regarding an unmanned out of control boat in the water off Sayville. 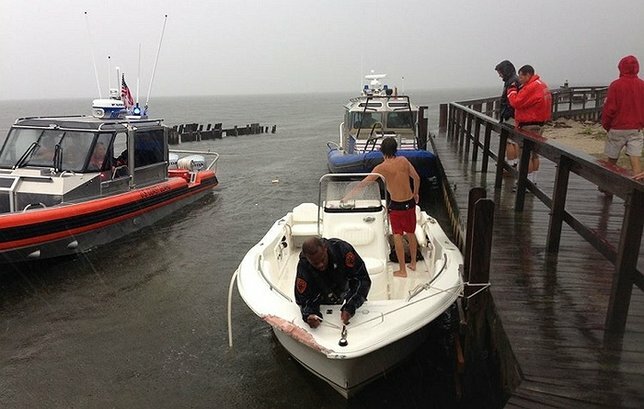 Marine X-Ray, Marine 35, the U.S. Coast Guard and the Bayport and Blue Point Fire Departments responded. A short time later, Marine Bureau Sergeant John Vahey, who was aboard Marine Charlie, located the boat one mile offshore between Brown’s River and Homan’s Creek in Bayport. Sgt. Vahey determined there was no one on board and he began a search pattern in the water for an occupant. Sgt. Vahey located Underwood at 8:36 a.m. near the Buoy 35 in the North Channel, south of Blue Point, approximately one mile from where the boat was found. Sgt. Vahey pulled Underwood from the water transported him to shore at Homan’s Creek in Bayport where he refused medical treatment. Underwood, 21, of Bayport, a swimming instructor, had been in the 80-degree water for approximately 90 minutes and was not injured. At approximately 8:45 a.m., Marine Bureau Officers Raymond Cairo, Dale Kelly and Raymond Harkins, who were onboard Marine X-Ray, approached the vessel and were able to foul the propeller with a line and life ring and slow the boat. Officer Kelly jumped from the police boat onto the unmanned boat and brought it under control. Subject: LongIsland.com - Your Name sent you Article details of "Marine Bureau Officers Rescues Man Thrown from Boat and Stops Runaway Vessel in the Great South Bay"